"Live as if everyday is a special occasion..."
It is that time of year again. Jack Frost is in town and we are all craving foods that make us feel warm and cozy from the inside out. Cue the hot cup of cocoa. A holiday tradition, I always get excited to curl up with a steaming mug of chocolatey goodness. But sometimes I'd find myself passing it up because I was trying to make healthier choices. This week, I had the perfect opportunity to come up with something that wouldn't make me feel guilty about indulging. As part of The National Post's Gastropost early inspiration team, I was sent a secret ingredient in the mail this week and asked to start developing a recipe for a sweet treat using Almond Breeze almond milk. The ingredient alone had me thinking: healthy and vegan! I started puttering around the kitchen and inspired by the season, I came up with a delicious, healthy and satisfying hot bevy that will send you to the tropics even during holiday time. 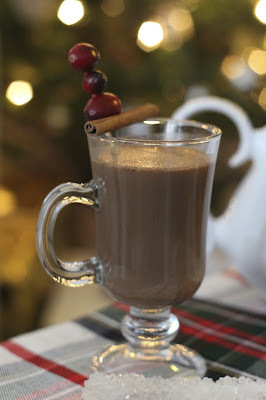 A coconut-flavoured, almond milk hot cocoa - no dairy, no added sugar but tons of super foods! The base of the drink is almond milk which is an amazing milk substitute. It also contains lots of protein, fiber and vitamin E. Almond milk is often on my grocery list and I use the unsweetened variety in smoothies, chia pudding and in lattes. It's really delicious and comes in different flavours like vanilla and chocolate…but I'm definitely partial to the unsweetened kind. In fact, it is one of the main ingredients in my favourite green smoothie recipe. Coconut oil is an ingredient we've all heard tons about lately. It's an incredible source of healthy fat, it's great for your skin and hair and can even serve as a natural eye make up remover! Over all- it's amazing. It's also known to aid in digestion, weight loss and helps to build your immunity as it has antifungal, antiviral and antibacterial properties. I buy cold pressed, organic virgin coconut oil and use it as a moisturizer. It smells amazing! You will also find a jar of it in my pantry as I try to cook with it whenever I can and use it especially in Thai cuisine. Cocoa is one of those ingredients that we've heard is healthy but it's not always clear why exactly it's good for us. 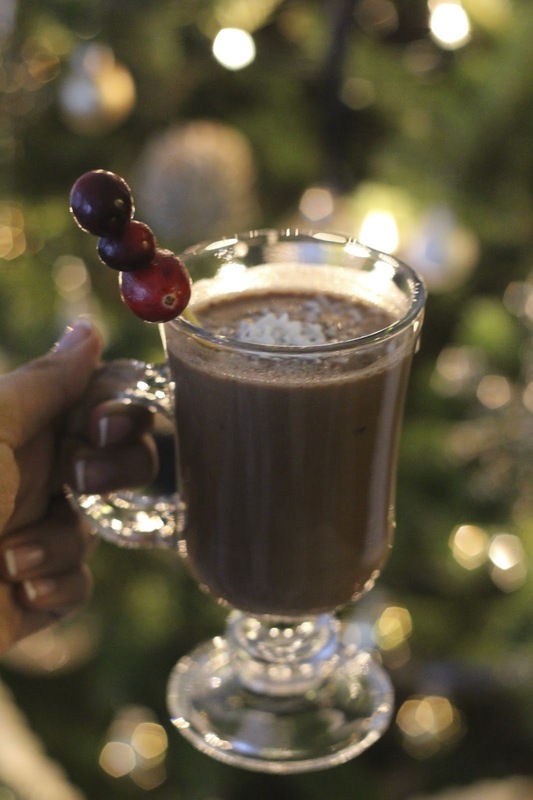 Cocoa contains antioxidants said to be twice as strong as those found in red wine. Many of these antioxidants actually become even more powerful when cocoa is heated. Cocoa also contains flavonoids which can increase blood flow, lower blood pressure in our body and improve heart health. often do not contain the health benefits that natural cocoa does. The good news? I've come up with an easy recipe to help you make a natural and delicious cocoa with all the health benefits. Please note: This recipe is best enjoyed while curled up in a blanket with your favourite holiday classic on tv. Cheers and wishing you all a happy holiday season! Thank you so much to Gastropost Toronto, Blue Diamond Almonds and Almond Breeze for involving me in this special holiday project. I work as a tv and radio host in the city of Toronto. I love to explore, try new things and blog about food & lifestyle. Since I know first hand how eating and living well can be a challenge when you are busy, I started writing this blog to share with all of you my collection of quick and easy recipes, health tips,dining and travel adventures -- in the hope that my stories might enhance someone else's experience with a tip, trick or recommendation. If it inspires me and is related to food and lifestyle, I will share it here. You can also find my videos and vlogs on my Youtube channel: thelifestylefile Please leave a comment, I'd love to hear from you! Happy Reading! Angelie Sood. Simple theme. Powered by Blogger.